All sections of the Russian National Orchestra play with immense virtuosity and cope with their conductor's demands with admirable aplomb and (the) technical team, headed by Rainer Maillard, has certainly produced a spectacular and glittering recording. Magistralement captée dans la grande salle du Conservatoire de Mosou, cette gravure est d'abord un choc sonore : rencontre avec les splendides sonorités (hautbois, harpe...) du National de Russie. (...) L'équilibre sonore défini par le chef est exemplaire. With his Russian National Orchestra on devastating form, Pletnev does it supremely well (...). It's a superb achievement. This is a performance that ballet lovers and Tchaikovsky fans alike can appreciate and enjoy without hesitation. The Russian orchestra has the right sound and virtuosity to do justice to it. Ondine's engineering is superb - a quality issue! For pure excitement and powerful orchestral articulation, this version of Swan Lake sweeps the board. Diese Schwanensee-Gesamtaufnahme nimmt gleichermaßen Intellekt, Gefühl und Phantasie gefangen. Dazu eine Aufnahmequalität, die mit Präsenz, Tiefe, einer großen dynamischen Bandbreite und weiträumigen Akustik rundum überzeugt. Großartig. 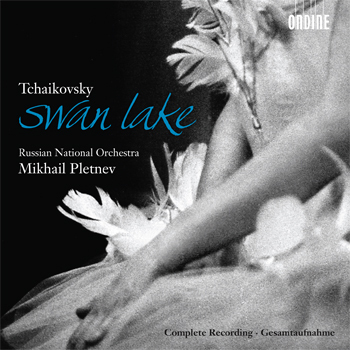 This CD features star conductor Mikhail Pletnev and the Russian National Orchestra with the complete recording of Swan Lake by Peter Tchaikovsky. Composed in 1875-76, this absolute masterpiece of Russian orchestral music has come to be regarded as the very quintessence of Russian ballet. Based on an ancient German legend and Russian folk tales, the libretto by Vladimir Begichev and Vasily Geltzer tells the unique and tragic love story of Prince Siegfried and Princess Odette, who is kept captive by the evil sorcerer von Rothbart, having been turned her into a swan by night and a woman by day. The CD release marks the 20th anniversary of the Russian National Orchestra in 2010, and the orchestra's debut on the Ondine label; since being founded by Mikhail Pletnev in 1990, the RNO has quickly reached a position at the top of Russian orchestras, as well as among the top ten of international orchestras (according to a recent listing by the Gramophone magazine). This recording was recorded and mastered by Emil Berliner Studios at the Great Hall of the Moscow State Conservatory.